Earlier I wrote a pretty comprehensive Guide on Time-Management and published my own process of How to Plan the Week. While those are really sophisticated I think that for some people they are a bit overwhelming at first, especially if you like to keep things simple. The advantage of things being simple is that the possibility of success gets higher. Or in other words the possibility of us just not following through with our great plans gets lower. Also the more complex our productivity system is, the more stressful it can be since it tends to create an overhead of itself. So the question became: How to be productive with the least amount of organizational overhead? How can I reduce my work with the system and increase my productivity while even lowering my stress level? The Problems: What’s Keeping You From Being Productive? 1. Not doing what is most important … and wasting hours rather going for what is more interesting, more fun, and easier at the moment. 2. Getting distracted a lot … and not having the self-discipline to stay on what I’m doing. 3. Just having too much to do … and thinking I can get everything done. This plan must be short and simple. That means it has 3 items ideally, but not more than 7 for sure. It is also short and – of course – in writing. The task is clearly stated, and here is what is important: it is the end-result of what you want to accomplish. So write a short list and keep it infront of you all the time. The idea with this plan is to get only the priorities on top. 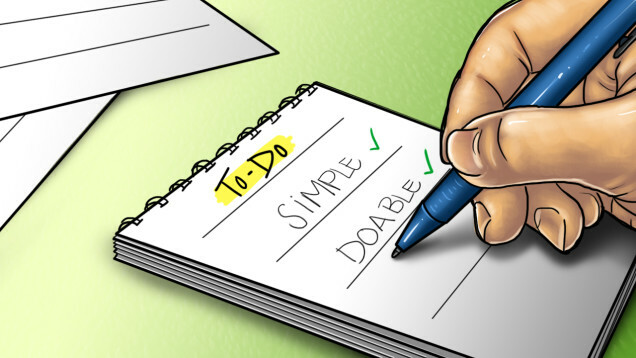 So write the most important task for the day on top: What is the most important thing I want to get done today? Add a maximum of two more priorities as second and third task. Then start with the first priority task. This really doesn’t allow procrastination to take place. I noticed that procrastination happens when we allow diffuse mental focus and when we lack clarity of what is important. Dreaming into the day may be convenient, but it’s much more inconvenient to experience the frustration by the end of the day. The list of your top 3 priorities for the day keeps you on your goal. If you can think about why you want that task to get done that day. This will create the drive, the energy, the motivation for it. This solves the problem of not focussing on the most important thing. I also noticed that sometimes some sense of urgency will make you more productive. So if you like, create some dependency to others (i.e. say you show them your work at a certain date). But this external motivation should be solved by having a strong and clear enough reason to do the task. This is true for your working environment as well as for your working space. In your working environment you have to make sure that you do not get interrupted from your work. You can’t create something meaningful if you have to answer the phone every 30 seconds. If people are walking by or you get disturbed by means you can’t change, it may be time to change your location. Other distractions are on your own working space. Clean your desktop and get rid of items that could take away attention from you. On your computer close the programs that you don’t need for your top priority, i.e. messenger, facebook, youtube etc. If you don’t need them for your top priority, consider turning of your mobile phone as well as the normal phone. Stop reading e-mail all the time, instead read email at certain times – my suggestion is twice a day. Those changes may seem small or not too meaningful to you, but these are the things that interrupt our workflow the most. You need to have a longer period of time to focus and to get into the flow. That’s when you really are productive. Usually there can be some time when it seems really hard to make meaningful progress. This is especially so when the task is a creative one, for instance writing. There may be the urge to switch to something else that is easier. That is exactly the moment where we have to resist that urge and keep at the task at hand. If we go through that we enter the stage of flow and we can be much more productive then before. So this is my simple 3 step productivity system. First create a daily plan of your priorities. Then make sure you have the environment set up to support you. And then apply your mental focus to your advantage by concentrating on the top priority until the result is reached. I think this is as simple as it gets. More detailed but also more complex ideas are in my Guide to Time-Management and in How to Plan Your Week. First time i am looking at your website and the ideas you given its really amazing. I hope, i can follow and implement the ideas without fail. Sean, in that case you don’t micromanage, you just procrastinate on the paper, by substituting in tasks that are easier and more fun, but of lower importance. In step 1 of this post I addressed that quite strongly, but you have to really implement the ideas. Great Article. One problem I have is once I try to start a session of productivity, I attempt to micro manage too much! For example, if I have a paper to write as a high priority task, but also have loads of dishes, laundry, and a motorcycle to work on (home based repair) I cannot adhere to doing to paper..at all. Best advice EVER! I have always struggled to keep to the more complex systems. This is straight forward and to the point. Thanks. Hey Nergis, looking forward hearing back from you!